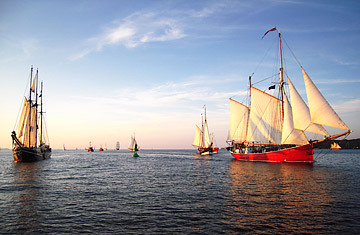 Traditional tall ships coming in at sunset on the Kiel Fjord. There are regattas, and then there's Kieler Woche, or Kiel Week. Every summer, the city of Kiel, on Germany's bracing north coast, plays host to the world's largest sailing event. More than 3 million visitors pour into town to cheer on 5,000 sailors from over 50 countries, taking part in some 400 races on 11 courses. This year's event takes place from June 16 to 24 and will culminate in an epic flotilla of towering historical and military craft.